This utility will create a clickable index page; a new worksheet with a hyperlink to all worksheets and chart sheets in your workbook. You can see this as a menu for your workbook with the names of- and a link to all sheets and a quick navigation back to the main menu (index worksheet). This can be useful when you are dealing with large files with a large quantity of worksheets and/or chart sheets. To quickly return to the index sheet ASAP Utilities has added a new name to your workbook that refers to cell A1 on the index sheet. 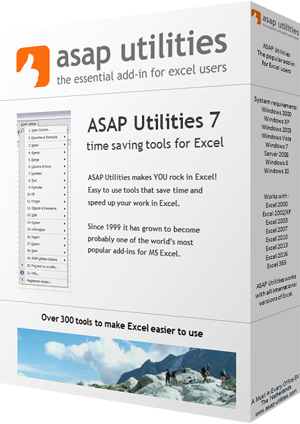 This name is "___INDEX_SHEET___ASAP_Utilities". To quickly return to the index sheet select this name in the name box in the formula bar. In Excel it is not possible to create a hyperlink to a chart sheet. To be able to link to a chart sheet ASAP Utilities uses a macro for this. This has a side effect if you workbook contains chart sheets and you use this tool and then the file is used by someone that does not have ASAP Utilities. When they then click on a link to a chart sheet they will receive an error that the macro cannot be found.